Where is Madeleine McCann ? Piers Morgan : Tonight, vanished. The case that shocked the world. Gerald McCann : The pain is never too far away from the surface. PM : On vacation in Portugal, Kate and Gerry McCann put their 4-year-old daughter Madeleine to bed and they never saw her again. KATE McCann : I don't know how much I love the children and there's no way I'd have taken a risk. PM : Four years later, after a global search, she's still missing. GMC : Madeleine's still missing. And whoever's responsible for taking her are still at large. PM : Who took Madeleine? Is she still alive? If she is, will her parents ever find her? KMC : It is wrong to give up on children who are still missing. PM : Tonight, Kate and Gerry McCann. Their hopes for Madeleine. PM : And their darkest days. GMC : At the lowest point, I thought our family was going to be destroyed. PM : Kate and Gerry McCann for the hour. This is a Piers Morgan Tonight exclusive. Kate, Gerry, thank you for sitting down with me. Today is the eighth birthday Madeleine would have enjoyed had she been with you. 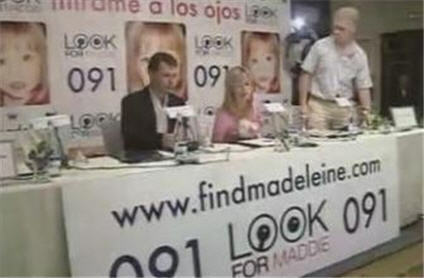 We still have no idea where Madeleine may be or what's happened to her. You've written a book, Kate, about your experience. It's based on diaries that you wrote from a few weeks after she'd vanished. Why have you done the book? KMC : Of course my reason for writing it all down is quite different to the reason to publish it as a book. And initially when I started to keep my diaries, it was really so that Madeleine would have an account so when we found her, I'd be able to fill in the gaps. And also showing them for when they were older. And then going back to 2008, I actually filled in the gaps before I started keeping my diary so a little bit about me and Gerry and our backgrounds. And again, that was all just for the kids. And I suppose it's always been the urge to get the truth out there. When there's been so many stories written before we have things hmm. And ultimately, Madeleine's fund was running out. And I knew that we'd need to raise money really to continue the search. PM : So all the money from this book is going to -- actually to the Madeleine Fund. KMC : I think so. Elle pense ? Elle n'est donc pas sûre. Pourtant il est imprimé sur la page de garde "all royalties donated to Madeleine's Fund". PM : So that you can continue to try and find out what happened to her. PM : You just don't know. I mean I'm a father of three children. I cannot imagine -- now I can remember my kids disappearing for a minute or two minutes and that awful panic that you feel as a parent when that happens. To be here, years later, and have no idea where she is or what may have happened, it must be excruciating, isn't it? GMC : It certainly was. And I think one of the reasons we've had so much public sympathy and empathy is I think every parent does know that feeling when your child is out of sight even for a few seconds and the panic it generates. And obviously, for any family like yourselves whose child has been abducted, it's the most terrifying experience. But you do adapt. (3) And the pain is not as raw. But, you know, we do still manage to get some enjoyment in our life and we've got two other beautiful children who are fantastic. And the support we've had from the public has really helped carry us through. But it's just always something inside and the pain is never too far away from the surface. PM : I mean, Kate, do you ever have a day where this doesn't consume you? PM : Have you considered having another baby? Has that even entered your thought process? KMC : No. I mean, I think you probably know obviously our three children were born with the help of IVF. And -- so it wouldn't exactly be straight forward anyway. But, you know, you can't replace Madeleine. And I know you're not suggesting that but I don't know. I think all the grief that we've been through and the busyness of everything, and obviously we've got Sean and Emily that we need to concentrate on. PM : Do you both 100 percent believe she's still alive? Or do you have to believe that? KMC : I don't think -- I don't think we can say 100 percent. I mean, you know, we're realistic. We know that there is a chance that she may not be alive. But what we do know is there's a very good chance that she's alive. And there's certainly nothing to suggest otherwise. And as you know, as well as many children who are found years down the line, they could have been written off, you know. And then they were found. So it would be wrong -- you know, it is wrong to give up on children who are still missing. KMC : We don't. But nobody came forward to eliminate themselves. PM : So you believe from all that you know that that shadowy figure that was seen with a young child was probably the abduction taking place? Is that what you think? Comme beaucoup l'ont réalisé dès le départ, le scénario d'enlèvement ne tient qu'à ce mince fil-là. Si après tout personne ne s'est fait connaître pour éliminer Tannerman, c'est peut-être parce qu'un tel personnage n'existe pas, ou n'est pas passé là en marchant dans cette direction ou à cette heure-là. Cela n'empêche pas les MC de passer par dessus ce que pointe PM : il n'y a aucun élément probant, ni d'une intrusion, ni d'un intrus. Dans "Madeleine" (p. 316), Kate cite les paroles du chef constable adjoint, justifiant le refus d'accès au dossier du LC : alors qu'un d'entre eux ou les deux sont peut-être innocents, rien n'indique clairement qu'on puisse éliminer leur implication dans la disparition de Madeleine. Au minimum les MC pourraient savoir ce qui est arrivé à leur fille. Et dans ce cas l'argent collecté grâce à la mention imprimé sur la page de garde ne servira pas à chercher MMC. Pourquoi Kate a-t-elle rapporté cela, qui jette une ombre certaine sur eux ? Elle rapporte aussi qu'on ne leur a donné que les trivialités qu'ils avaient déjà. Est-ce que sa colère l'a emporté sur sa prudence ? GMC : Yes, completely. And I think, you know, another thing, aspect about the book, I strongly believe a good reason for publishing it is putting these facts together about the sighting of the man carrying the child and the detail of that, as seen by our friend, Jane Turner (sic). Jane hadn't seen him, she literally would have been plucked from thin air. PM : Let's get back to what happened. You were on holiday in Portugal. You were at a child-friendly resort. And at about 7:30, you were putting your kids to bed. You had the two 2-year-olds and you had Madeleine who was 4. Tell me what happened. Gerry, you start. PM : This remains one of the highly contentious parts of this. Because you're both professional medical people. And you've got three very young children. And I know that you've expressed regret over this. And I'm not after more of that. It'd be completely pointless. In terms of the normal practice, though, when you were with them, would you ever have left them alone in that situation if you'd been at home, for example, back in England? PM : I mean, Kate, as a mother here, you must live through that all the time. And beat yourself up. I've seen you do that and I've heard you do that. And my heart goes out to you because there's not a parent I know that hasn't mislaid a child at some stage. KMC : All I can say is if I'd ever thought there was any risk at all, you know, it just wouldn't have happened. And that's all I can say really, you know? And it's hard to, you know, sometimes to think at home when I was going to the post office and I had the twins in the double buggy because it wouldn't fit through the post office door, I used to get my aunt to come and meet me and just stand by the door even though it's a tiny post office and I could see the buggy so nothing hmm with sort of how we act in Portugal. And all I can say, it just felt so safe. You know it was a family-friendly resort. The first time that I've ever been to Portugal but all the family and friends we knew who had been there said it's, you know, a lovely country and it's really safe and it's for families. PM : I mean, Gerry, I mean, the difficult question, but obviously the resort you were in had lots of nanny facilities. And they weren't that expensive to use. And you both were professionals earning money. Another criticism as put to you is why didn't you just pay to have a nanny if you wanted to go out to dinner? PM : You said -- I guess that most people's homes are secure. GMC : From day one is what we can do to find Madeleine and those responsible. And you know if we can go back and jumped in the hmm, we would be there. KMC : hmm I'd want to change what we did that night obviously, you know. PM : Do you have a lot of regret? Now looking back, obviously not just because Madeleine went, but do you think with hindsight, you should have done more to protect them? Do you feel that? KMC : Well, obviously, because of what's happened, you know. And I beat myself up every day but I can't change it now. I have to go forward and see what I can do now. PM : I want to talk to you about the moment you discovered that Madeleine had gone........ What was the exact moment -- let me ask you, Kate -- when you realized Madeleine had gone? KMC : Well, went back to do a check at 10:00 and I went through the patio doors at the back. And I listened for a minute in the living room. And it was all quiet. I just noticed that the door to the children's bedroom was quite far open. And we always leave it just so it's slightly ajar, just to let a little bit of light in. And I thought to myself, did Matt leave the door open at half nine? Matt checked on the half nine. And I thought, that must be what happened. (17) So I went to close over the children's door. And just as I was about to close it, it kind of slammed. Like a gust of wind had shut it. Then I thought I'd left the patio doors open. So I just checked and they were closed. (18) And then I went back just to open the door again a little bit. And just as I was doing that I just -- I just glanced at Madeleine's bed which was by the wall. (19) And it was really dark and I couldn't quite make her out. Tout parent, mais pas Kate, vérifierait immédiatement que le claquement de la porte n'a pas réveillé les enfants. Elle revient en arrière pour voir si elle n'a pas laissé ouverte la porte-fenêtre (on ne comprend pas pourquoi elle l'aurait fermée, puisqu'elle ne comptait pas rester plus que quelques secondes dans l'appartement), ce qui serait indispensable pour que la porte claque aussi violemment. Tels sont les souvenirs reconstruits et il n'est pas étonnant que le procureur de la république ait voulu reconstituer cette scène. But I just kept looking for what felt like minutes thinking, you know, where is she, you know? It seems daft now because normally you'd think I'd put the light on. But in fact it's that in built thing of don't wake the kids up. And then I looked and realized she wasn't there. And I thought, had she gone through to our bedroom? And you know that would explain why the door was open as well. So I just quickly looked in our room. (20) And she wasn't there. And that's probably the first time that panic starts to build. So I'm back into her room. And just as I did that, it was the curtains which were closed just kind of blew open. And hmm I noticed that the shutter was open. The window was open. PM : And what did you think in that moment? KMC : I thought someone's taken her. PM : You went down to tell Gerry straight away? KMC : Yes. I just basically and quickly whisked around the apartment, like 15 seconds. I don't know why. (21) In my head, I was just thinking if someone's been in and she's cowering somewhere I guess is why I did it. And then I just flew out through the back, down the stairs to the restaurant. And as soon as the table was in sight, I just started screaming "Madeleine is gone". And then they all jumped up and Gerry said "she must be there, she must be there". But obviously I knew. PM : And, Gerry, this is every father's nightmare. Every mother's nightmare. But as a father, a young girl, and she's gone. What are you thinking? Quid de ses empreintes ? C'est aussi lui qui aurait refermé la fenêtre... Pas d'empreintes, pas d'action ! PM : There was a report that that morning Madeleine had asked you why you didn't come when she'd been crying. Did that set alarm bells off when she did that? PM : Do you have any blame that you would attach to the resort itself? Now given the time that's gone past? PM : Have there been a number of burglaries there? KMC : Yes. There's been quite a lot of burglaries. PM : Do you know how many there have been now? Do you know all the figures for that? GMC : No, we're not sure. I mean it's difficult because we didn't have access to the crimes, and things of that. We know of other people contacting us saying the apartment had been burglared (sic) in. PM : One of the real frustrations for you is there's these two investigating authorities. One in Britain, one in Portugal. Do you think there is a missing link here? Do you believe that if enough time and money and resources devoted to this, that there's some stone that's been left unturned in this investigation? PM : When the police turned up, what was their initial behaviour like towards you? We know that things turned pretty unpleasant quite quickly. But when they first arrived, Kate, were they sympathetic? Were they helpful? What was the mood like? PM : Did you think -- did you think, Gerry, from the start that they were suspicious of you? GMC : Certainly. (34) And the next day, I know that we as the parents, and being there, and the last people to see Madeleine, that we'd be investigated. I think anyone who's got an inkling of any sort of police type investigation knows that's going to happen. So, you know, we went in and gave statements and were happy to help. And things like, you know, both the information we gave about Madeleine and what she said that morning. We gave all this information. That's exactly what we've done in the hope that it would help. PM : Has there ever been any discrepancy between anything that either of you has said? Any of your friends that were you that night? Has there been anything that if an outside lawyer looked at this, they would say, that doesn't add up? PM : And also as Kate said, if it was all completely in agreement about every tiny detail, that to me would seem more suspicious. PM : I want to talk to you about the moment that you realized the first time that the Portuguese police were not looking for anybody else in connection with Madeleine's disappearance. They were looking at you. When the mood began to change, massive media attention. A lot of criticism against the Portuguese police and authorities for not move quickly enough, not doing their job properly, and they retaliate, it seems to me, or they respond -- let's be polite here -- in the worst possible way as far as you're concerned. They make you formal suspects, arguidos. What was the moment like for you when you heard that was happening? Because that completely changed things. PM : That must be the worst moment of all, other than the moment you know that Madeleine's gone, to have somebody look you in the eye and effectively say to both of you we think you killed your daughter. That's a terrible moment, isn't it? KMC : I just thought, what is going on here? You know, but you're right, nothing is worse as the first night but it just felt like we were about to get destroyed at that point. PM : Gerry, you kept remarkably calm. That almost played to your disadvantage. People thought, why is he being so calm? Had you been hysterical, they'd say, why is he being so hysterical? You can't win in that position. GMC : You didn't see me behind the scenes. PM : Were you offered a specific deal like that? Were you offered if you'd -- if you accept that you did this, you can go to prison for two years and be out? PM : That is what I read. Is that true? KMC : It's true. (41) I mean, it's hard because nobody likes to be called a deal. But indirectly it was put to us that if we confessed to hiding Madeleine's body -- so not killing her but accidental death -- if we confessed to hiding the body, then it would be a non-custodial service, two years. And Gerry could go back to work, we were told. And that was just crazy. You know the hardest thing, I should say, about the arguido was the realization suddenly that no one was looking for Madeleine, because they if they were looking at us and focusing all their attention and resources on us or trying to find stuff against stuff us, then who was looking for Madeleine? (38) So I was angry. I mean, I'd gone from kind of this downward spiral in July, when nobody was really speaking to us and August full of headlines. And suddenly I just felt strong, because I thought, no, I'm damned if this will happen to my daughter, you know? If they're not going to be there for her, then we have to fight for her. PM : I want to talk to you about the fight that you then launched to try and find Madeleine, and what you think are the possible unanswered questions that need to be answered. PM : That was just after you'd been informed you were no longer arguido, no longer a suspect, as they call it there. And whilst there's relief in your voice, Kate, there's also, I can tell, a real simmering anger. What did it do to your public opinion, particularly back home here, where it was such an enormous story? You were front page news for weeks after weeks after months after months. A lot of it negative, a lot of it pushing really hard, as almost as if some of the media wanted you to be guilty. I remember reading the headlines thinking, wow, they're pushing the envelope here. You were having to live in this country and to live with being called arguido, suspect. That must have been a pretty awful experience, wasn't it? GMC : I think it's a bad episode from the media, you know, because obviously we took action against the Express Group and it was a last resort. But they were rehashing the headlines from months before over and over again. And we were prepared to cut a bit of slack around the arguido time. We were declared arguidos. These things were happening in Portugal. But, you know, months later -- and some of the stories were just completely fabrications. It was detrimental to the south (inintelligible). KMC : I think the other important issue were the stories that were being put out there were implying that Madeleine was dead. PM : Of all the mad cat theories -- and you must have seen more than anybody else. You must hear and see everything that literally comes out about this. Are there any that you think have any kind of credibility that you think should be really pushed further? GMC : It's incredibly difficult, Piers, because if you speak to -- here on in the island US , the National Center for Missing and Exploited Children, who've got the most expertise in these types of stranger or stereotypical kidnappings. Well, (inaudible) Ernie Allen ? says and hmm says until you know who has taken your daughter, you don't know. And you can think of a whole host of scenarios. And I think that he's given us some examples. When Elizabeth Smart was abducted at knife point from her bedroom, which she shared with her sister, he says there was no way we could have known that she would be living just miles from home. Jaycee Dugard -- I mean in all of these cases, who could have imagined that? So we have got to be completely open-minded as to who's taken her and why. And I don't think we'll know until we find our person. PM : One of the things that stuck me in the book is your quite open account of what it's done to your marriage, this. I mean, do you feel that you've been quite fortunate to stay together? Do you think this could have split up many couples? KMC : I think that's without doubt, really. I mean it's such a major event to happen to your life and the consequences and ramifications are massive. And we're very fortunate. You know, we had a strong relationship before. We've got a great family and really good friends who have supported us when everyone hmm. And I should know the statistics will show that most marriages break down in circumstances like this. PM : I mean, at its worst, what's it been like trying to have a relationship through this? KMC : No. I mean, I don't think I was ever suicidal but I often wished my life would be over. You know, I'd never had planned anything or done anything. I knew that wasn't a possibility, that wasn't an option. But, you know, so much pain. I used to think about, God, let's just pull the duvet over and I won't wake up tomorrow. PM : Gerry, there have been times where he's been -- he feels bad now -- but being unable to support you. That must have been a particularly difficult period for you, when even Gerry couldn't seem to provide any comfort for you. KMC : It was. I mean, you know, there were times when I just wanted to be held or something and -- but I -- equally I know that the times when I couldn't support my mom and dad, for example, and we've all suffered in this. I guess you have to make sure that you're afloat in order to be able to support somebody else. You know, that works both ways. And we are very fortunate that we've had really close family that can support us at those times. PM :I want to talk to you about the diary that you've kept and how cathartic that may have been for you, how helpful. PM : How hard is it for you to see video footage of Madeleine, even now? GMC : I think it's the one medium that really brings her back to me, in particular, seeing her moving and her voice. And it's our Madeleine as oppose to the iconic picture of Madeleine, the missing child. It's our daughter. And sometimes we just go and put the video on and sit and watch it with the kids, as well. PM : You're both religious people. You had a private meeting with the Pope. What was that like for you, Kate? KMC : Well, at that point, it was just incredibly important. I mean, I truly believed that would make a difference for Madeleine. And I've often described it as the next step, really, the closest you can get to kind of meeting God in some way. And I just thought all my prayers, etc, would be channelled more quickly to God. PM : What did he say to you? KMC : He just very simply took a photograph of Madeleine and placed his palm on it and blessed her. And he just said I'll continue to pray for Madeleine's safe return and for all your family. PM : Has what's happened to you damaged your faith? KMC : It has challenged my faith. I mean, there's no doubt about that, really. I'm still, you know, I've still got my faith. But there have been times, and particularly back in 2008 -- was my worst year. I'm not embarrassed to say I felt angry with God. And I couldn't understand why all this happened, not Madeleine being taken, because I don't believe that was the will of God, but everything that had happened subsequently, and the fact that we just felt so many challenges, particularly in Portugal, where I felt we really needed help. I really wanted someone to stand up and say, this is all wrong, we'll help you. And I guess, you know -- I threw that back at God, really, and said, why are you allowing all of this to happen, you know? We can handle so much, but this just seems too much. PM : Gerry, do you still keep Madeleine's room as it always was? PM : How have they dealt with it? KMC : Brilliantly. We've always been as honest as we could be with them. And that was certainly the advice we were given. PM : What do they think happened to Madeleine? KMC : Well, they know that a man has taken her. And they know that that's wrong. And they know that we're all looking for her, lots of people are helping us. GMC : Looking at Sean and Amelie, though, you really didn't know that a major trauma has happened in their lives. They can talk about -- we were on holiday last week and meet little kids. And they talk about brothers and sisters, and they say, oh, we've got a big sister Madeleine but she's missing and we're looking for her. And they talk about the response. PM : Today would have been her eighth birthday. I mean, every part of you must be wondering what she looks like now, apart from anything else, how would you have celebrated today. I mean, do you commemorate the day? Will you do anything with the other two children? How do you deal with a birthday when she's not there? GMC : In many ways, I think launching a book today is a good thing to do on her birthday. It's doing something positive. It's reenergizing the search. We've launched the campaign, as she said, with News International to get a review. And I think these are milestones that you pass and you know there's going to be media attention irrespective. So it's always a good time, from our point of view, to capitalize on that. We've just got to find her really. PM : We'll talk specifically about how people watching this can possible help you, and to see also where you think the focus of investigation should now be......... How can people help? If you're watching this interview and you're keen to try and help you in some way in the search for Madeleine, what is the most effective way that people can do this? PM : Madeleine had a very distinctive eye pattern, didn't she? Tell me about that, Kate, in case people see somebody they think may be Madeleine. Tell me about her eye. Pas d'emphase ? Mais cette histoire de colobome a été à la base de leur campagne ! Et en fait de marketing, c'était un bon truc ! Rétropédalage ? PM : Slightly distinctive eye colours and a little fleck. And do you know if that would be still there if she's now eight years old? PM : If people see somebody they think could possibly be Madeleine, who should they call? GMC : They should call the police, local police. You know, if they really think it is Madeleine and it gets addressed there and then. It's actually quite difficult if you get information coming in historically about sightings. So the advice is clear, is should be to call the local police. KMC : But if they could call all options and let our investigation team know as well, that would be really helpful. PM : Have there been moments when you've been pretty much confident that you may have found her? KMC : I don't think so. And I don't think we've ever allowed ourselves to go there. I mean, earlier on when there was the odd kind of -- what turned out to be a hoax call, you always have that real hope of this could be it, it could all just be over. But since then, because of the total and emotional roller coaster really that we've been on, you just try and hold back really. And a lot of the pictures that we've been sent that have been looked at, you kind of know it's not, but you just need total verification. PM : Do you still talk to Madeleine? Do you still have any kind of conversation with her? PM : Can you sleep OK now? KMC : I can, actually, yeah. It took a long time, cause the nights were the worst. I mean, I still have the odd night where if she's very much on my mind and something's upset me then it's hard to sleep, but I'm sleeping fine now. PM : I mean, there have been -- as you said earlier, there have been cases quite recently of girls who just disappeared reappearing -- in Jaycee Dugard's case, 18 years later -- from captivity. When you see those stories, does your heart flip a bit? Do you think there's hope, or is it almost like a knife in your back that Madeleine hasn't? KMC : I think, overall, it gives you hope. I mean, you know, obviously every day we hope that it's not going to be 18 years, as every parent would. But at the end of the day, it just highlights how easy it is for children to disappear off the radar and to turn up, you know, many, many years later. So, by that point, many people would have written that child off for dead and it just shows you how wrong you can be. GMC : I think the strongest thing for us is the public consciousness that these sorts of abductions, children are found. And that is more important and it's really important not to give up on Madeleine. You can't give up on them. You've got to keep her image out there. And who knows how she'll be found, whether it be recognized. Mostly we want to try and track the abductor. PM : I mean, there's a tiny chance, I guess, that Madeleine might be somewhere where she may see this interview. You never know. You don't know who she's with or where she is. If she was, what would you say to her? PM : Kate, what would you -- what would you say, if you had the chance? KMC : I would just say, you know, we love you, Madeleine. We're not giving up. We're still looking for you. If you can, let somebody know, honey, and we'll get you home. PM : Well, I -- I just hope you keep the faith and that she turns up. I think everybody does. It's been a harrowing time for you. Can't even begin to imagine what you've been through, but I really appreciate you spending the time with me. GMC : Thank you very much for having us. (1) Pour le première fois depuis 4 ans Gerald MC admet implicitement que Madeleine puisse avoir souffert mentalement/affectivement. (2) Il est intéressant que ce point essentiel, l'idée torturante et incontournable de la vulnérabilité mentale/affective d'une si jeune enfant (même si, (1), elle n'a pas souffert physiquement), soit abordé.. par l'interviewer. Les MC n'ont jamais fait allusion à cela ou l'ont écarté comme étant "négatif", préférant évoquer le manque que l'absence de Madeleine a suscité dans la famille. (3) Voilà une réaction incompréhensible, ce que suggérait PM, c'est précisément qu'il n'y a pas d'adaptation possible, on ne peut s'y faire. Il ne s'agit pas de souffrance suscitée par l'absence, mais de l'angoisse de l'incertitude. (5) PM entreprend de demander pourquoi il n'y a pas d'indice d'intrusion et semble décontenancer les MC. Nous n'ignorons pas qu'il est possible qu'elle ne soit plus en vie. Mais ce que nous savons, c'est que les chances qu'elle soit vivante sont grandes. Et il est sûr que rien ne suggère le contraire. Le choix des mots surprend : rien ne prouve que l'enfant soit morte, mais il y a des éléments qui vont dans ce sens. Est-ce encore prendre son désir pour la réalité ? PM exprime son étonnement, mais l'applique au manque de preuve de quoi que ce soit. Les MC vont rectifier rapidement..
(6) La conclusion de DCI Redwood (Crimewatch, octobre 2013) donnera raison à PM : l'homme n'était pas un ravisseur, mais un père ramenant son enfant de la crèche de nuit. Il semble que cet homme ait fait une déposition auprès du LC en mai 2007, fournissant même une photo du pyjama de son enfant. Est-ce en raison du pyjama (différent de la description faite par Jane TB, très proche du pyjama que portait Madeleine selon ses parents) que le LC n'a pas jugé le témoignage pertinent ? Toujours est-il qu'il est resté dans le dossier (non divulgué) du LC d'où DCI Redwood l'a extirpé. (7) Le timing précisément n'offrait que l'avantage de placer le ravisseur et Gerald MC dans la même rue au même moment (témoignage de Jane TB), mais le scénario d'enlèvement était tiré par les cheveux. Il fallait que le ravisseur soit entré avant Gerald dans l'appartement et s'y soit caché pour en ressortir immédiatement après son départ, Madeleine dans les bras. (8) Ce signalement a été rapporté par la presse irlandaise en juin 2007, pour la première fois, on ignore pourquoi il n'a pas été repris par la presse britannique. Alors que Jane TB n'avait vu que deux pieds nus et le bas d'un pyjama, les Irlandais ont vu une petite fille ressemblant en tous points à Madeleine. Les Irlandais n'ont pas plus que Jane TB décrit les traits du porteur d'enfant, mais ils ont donné moins de détails qu'elle sur son acoutrement. En revanche la manière de porter l'enfant était complètement différente. Smithman (le nom attribué à l'homme aperçu par la famille S) ne portait pas l'enfant comme l'homme vu par Jane TB (Tannerman). Par ailleurs un des Irlandais remarqua que Smithman portait normalement, mais maladroitement. Enfin ce même Irlandais et sa femme, après avoir vu Gerald MC descendre d'un avion avec son fils dans les bras, se dirent que Smithman pourrait être Gerald MC. Après avoir pendant deux ans esquivé la délicate question "Smithman", les MC l'ont évoquée dans leur reconstriction, où ils prennent des libertés avec les témoignages de la famille S afin de tenter de fondre les deux ravisseurs en un. (10) Si ce n'était pas une question d'argent, c'était une question de quoi au juste ? De là où ils étaient ils ne pouvaient voir une lumière s'allumer dans la chambre des enfants (de l'autre côté de l'immeuble) ni les entendre appeler. (11) PM s'étonne avec raison, car on pouvait entrer dans l'appartement comme dans un moulin puisqu'une porte restait ouverte. PM a l'élégance de ne pas insister, mais les MC eux-mêmes ont révélé qu'une porte était entrouverte, ce que leurs compagnons de voyage ne faisaient naturellement pas. (12) Mais ils fermaient les portes à clef pendant la journée. Ils ne pensaient quand même pas que la présence d'enfants éloignerait les cambrioleurs. (13) Le sens commun dit le contraire et, comme les MC sont de bons parents, on a du mal à croire qu'ils aient pris un tel risque, non pas d'enlèvement, mais de sortie d'enfant à leur recherche. (14) Tout le monde conviendra que le feu des projecteurs sur l'hypothétique ravisseur est une création 100% macanienne. La réaction de PM est flegmatique : quelqu'un quelque part sait ce qui s'est passé. (15) On sent une pointe d'ironie. Les MC sont légèrement désarçonnés. (16) L'hypothétique ravisseur pourrait-il récidiver si le cas est si rare ? Gerald évoque le seul cas européen d'enfant raptée de chez elle par un prédateur sexuel (il l'enleva de sa baignoire, alors que sa mère venait de quitter la pièce, et l'abandonna dans la rue, vivante, un quart d'heure plus tard). (17) Ce détail est une nouveauté narrative, inspirée sans doute par les commentaires de détectives en pantouffles qui remarquèrent très vite que si Matthew MO avait vu les jumeaux de loin grâce à la porte ouverte et si personne n'était entré dans l'appartement entre son passage et l'arrivée de Kate MC, la porte devait logiquement être ouverte. Remarquer que Kate ne répond pas économiquement à la question qui porte sur le constat de la disparition, mais commence la narration, à présent très rôdée, au commencement. Le seul point pertinent tient en quelques mots : Et alors j'ai regardé et réalisé qu'elle n'était pas là. (18) De son propre aveu elle ne compte pas entrer dans la chambre, mais écouter pendant une minute et elle prend la peine de faire glisser la porte-fenêtre complètement, derrière les rideaux et les double-rideaux ? (19) La narration a changé depuis la reconsfiction. Sur le point de refermer la porte, elle ne pense pas que tant qu'elle y est elle va jeter un oeil dans la chambre. Mais il est tout simplement impossible de rouvrir la porte et voir le lit de Madeleine sans engager la tête à l'intérieur. (20) En allumant ou non ? (21) Certains, sur les forums, se sont étonnés que, certaine de l'enlèvement, Kate MC ait cherché dans l'appartement. Elle parle de 15", mais Gerald se préparait à aller voir ce qui se passait, car 10' s'étaient écoulées depuis le départ de Kate. (22) C'est probablement un lost in transcription. Gerald doit avoir dit elle ne peut pas ne pas être là. (23) Il semble avoir baissé les persiennes et être sorti pour les soulever et y être parvenu. Toutefois il est impossible d'enrouler le volet sans la sangle intérieure, on peut enfoncer à force le volet à l'intérieur de la boîte, mais dès que l'on lâche la base, le volet retombe totalement ou en partie, en général cassé. (24) Comme si PM souhaitait éviter à Gerald MC des propos compromettants, car enfin il y avait peut-être autre chose à faire qu'à expérimenter les persiennes... Comme par exemple courir comme un fou à travers le parking en hurlant le nom de Madeleine, peut-être recroquevillée dans la végétation, blessée, terrifiée. (25) On ne saurait mieux dire pas de spéculation, des faits ! (26) En fait de faits, PM en sera pour ses frais. Le prédateur, si prédateur il y eut, ne passa pas par la fenêtre ni à l'aller et encore moins au retour, alors qu'il était chargé. la microvégétation de lichens sur l'appui de la fenêtre n'a pas été dérangée. Au reste pourquoi passer par la fenêtre (à 1m de hauteur) quand la porte est ouverte ? (27) Gerald MC est seul à dire qu'on aurait vu quelqu'un entrer (même en ayant les yeux rivés sur le haut de la porte-fenêtre, l'obscurité n'eut pas permis de la voir glisser). Par ailleurs les MC étaient assis de telle façon qu'ils tournaient le dos à l'immeuble. (28) Non, Gerald MC ne semble pas plaisanter. (29) Il est invraisemblable qu'un enfant rapporte, le matin, un incident survenu lors du bain de la veille. (30) Une ronde d'une minute toutes les demi-heures, ça laisse pas mal de temps pour se réveiller, se trouver seul, pleurer et éventuellement se rendormir. Mais Madeleine, selon Pamela F, a pleuré et appelé son père pendant 75 minutes, le 1er mai. (31) Cet argument aussi provient des forums : MW aurait dû expressément avertir ses clients du risque de cambriolage. (32) La revue britannique découvrira 195 pistes qui ne mèneront qu'à quelques suspects, déjà interrogés par la PJ, qui seront interrogés à nouveau, en vain. Par ailleurs, lorsque Paulo Rebelo remplaça Gonçalo Amaral comme coordinateur de l'enquête, il entreprit exactement cela, une revue, qui ne mena à rien sinon à une reconstitution à laquelle le groupe se déroba. (33) Le sentiment d'urgence, cependant, était omniprésent, mais il s'agissait de retrouver une petite fille qui s'était perdue et s'était peut-être blessée. (34) Malheureusement, ce n'est pas vrai, la meilleure preuve étant que la PJ a laissé Gerald assister à l'audition de Kate, assis derrière elle et la réconfortant. Autre indication de confiance : Gerald a changé de narration entre le 4 et le 10 mai. La police n'a pas réagi. (35) Bien répondu, mais PM pense manifestement à autre chose. Peut-être a-t-il parcouru le rapport de classement des procureurs où ces discrépances sont mentionnées (un des objectifs de la reconstitution était de les clarifier). (36) Ce que Gerald ne dit pas, c'est que dans sa première déposition et dans la déposition collective concoctée avec le groupe il dit la même chose que Jeremy W et Jane TB : il ne traverse pas la rue, c'est Jeremy qui traverse, devant logiquement traverser pour rentrer chez lui. (37) Il serait intéressant de savoir quels sont ces mensonges qui auraient fuité, hormis les chiens et le soupçon de mort de Madeleine. (38) Ces propos indirectement diffamatoire (arrêt de la recherche de Madeleine sous le prétexte fallacieux de sa mort) sont totalement démentis par le directeur de la police judiciaire et le procureur général de la république qui n'ont cessé de dire, après la constitution des MC comme témoins assistés, que toutes les pistes restaient ouvertes. (39) Malheureusement Gerald MC ne répondra pas à cette intéressante question. (40) Ils n'ont jamais été soupçonnés d'assassinat, mais de recel de cadavre et, évidemment c'est là le point le plus délicat, d'une obstruction conséquente de l'enquête. (41) 1) il n'y a pas de marché possible dans le système inquisitoire et 2) le recel de cadavre n'est ni considéré comme un crime ni puni par une peine de prison. (42) Les MC n'ont jamais été soupçonnés d'avoir enlevé leur propre fille, tout juste d'avoir caché le corps de leur fille. (43) On ne s'attend pas à un contrôle des émotions de la part d'un père d'enfant enlevé. Pourquoi au reste contrôler puisque la police s'occupait de rechercher leur enfant ? (44) PM ne pose cette question qu'à Kate MC. (45) Ce message de Noël à Madeleine, une initiative qui ne sera pas renouvelée, semble s'adresser à quelqu'un se trouvant, sinon de son plein gré du moins pas à son corps défendant, sur une autre planète, mais regardant la BBC ou Sky News, les parents devant découvrir la cachette. (46) En fait une équipe de la PJ de Porto entreprit une revue au grand dam du Ministère public. (48) Bien que toute anomalie de l'oeil commande de consulter un spécialiste, il semble que les MC n'en ont rien fait puisque Gerald ne sait pas si l'anomalie de l'iris est un colobome et n'émet qu'une opinion. C'est du reste de la famille, et non des MC, qu'est venue l'idée de faire du "colobome" le fer de lance des campagnes. Aussi bien les MC ne s'y sont pas opposés, peut-être parce c'était un excellent marketing ploy* ("coup de marketing"), comme l'a souligné Gerald MC à Vanity Fair, en janvier 2008, tout en admettant que cela pouvait conduire son bourreau à lui faire du mal, par peur d'être identifié). La décision de recourir à ce seul trait distinctif était difficile, car elle pouvait signifier un arrêt de mort si Madeleine était encore vivante. Il ne semble pas que les MC aient débattu en famille si l'atout publicitaire valait le risque de mort ou de mutilation. N'était-il pas préférable qu'elle survive plutôt qu'elle meure ou soit mutilée en raison d'une décision prise par ses proches ?